The Zebra GC420 range of desktop printers offers you on-demand labeling in a variety of applications – healthcare, production and logistics to name but three. Based on a well proven design, the mechanics have proven themselves over the years to be solid and reliable. 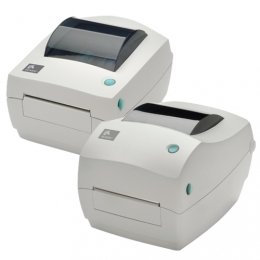 Both of these compact label printers – direct thermal (GC420D) and the thermal transfer option(GC420T) produce high quality printed labels using their 203dpi print heads. Maximum print width is 104mm with a maximum print length of 990mm. Logos and complex designs with graphics are possible due to 16MB Flash and SDRAM and a 32-bit processor. ZPLII and EPLII ensure easy integration into your existing system and a choice of three interfaces – parallel, serial or USB further simplifies your connection.